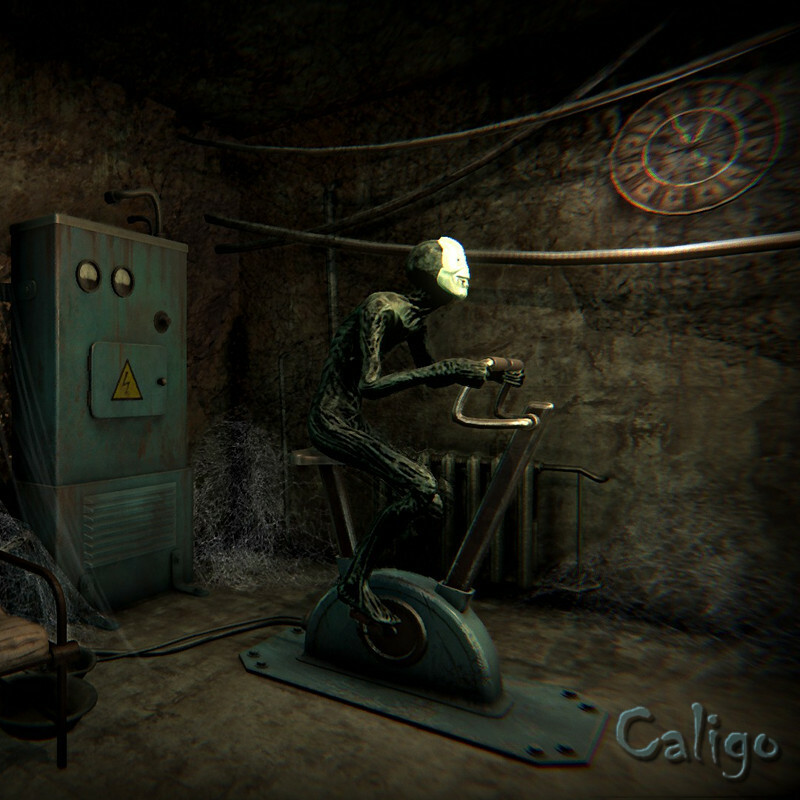 Caligo¹ by Krealit is absolutely gorgeous, but also very empty, almost vacuously so: linear with little exploration value, a forgettable story, and nothing to really engage me. The main narrator looked like someone posing as a character in a black metal satire cover band, and sounded like someone who had had his voice artifically slowed down to make it sound deeper, but which really only made it sound slow. This guy unfortunately tried to compensate by talking a lot. His loin cloth was a nice touch, though, finely accessorizing his slim pants. Other than the main narrator, the voice acting was alright (not the best acting, but acceptable). The developers clearly show that they know what they are doing from a technical and visual point of view: the excellently competent environments are quite a beauty to behold. Each chapter has its own distinct, unique style: one of them had a particularly graphite look to it, making it, without closer inspection, look hand-drawn, and also had a bit of Giger in it while at the same looking a lot like the cover of a viking or death metal album (which may or may not be a good thing), and in the oak chapter I had a bit of a Stendhal moment. The choice of music is fitting. Character animations are excellent. The special effects are great. The developers apparently master the technical aspects of how to put together a game, and on the surface, everything is perfect, but then, as we take a peek beneath the surface, things start falling apart and there’s really nothing there for me to care about or engage in. If you just want to take a walk through beautiful scenery, the game kind of works (the oak chapter could be perfect for a walk in the woods, listening to the wind in the trees, birds singing, and so on), but sadly there’s nothing to really explore. The path you follow is entirely linear (invisible barriers force you to stick to “the one true path“). There are no forks in the road you’re following. The environments seem totally disconnected from each other and what’s supposed to be the story, and the stories that could be told aren’t. There’s nothing to really look at and ponder over. The game comes off as an incoherent mess of individually beautiful or interesting pieces. It all looks great, but feels so empty. Why does it look the way it does? No idea. I guess the developers didn’t want to put the player in an empty room, which they could have — without it making any difference at all. I think the story is meant to be about story telling and the joy of it — which is commendable — but I just don’t see the game engaging in any actual storytelling and instead it just ends up talking about itself, trying to cover up for the fact that there is nothing to talk about. Don’t mind what you see here, there’s absolutely nothing to look at. My greeter and guide sets the tone early on. The whole game feels empty and insincere. Even the game itself seems to be aware of this. Also, when even the main protagonist asks what the point of it all is, then you know something is up. I urge you to keep on doing what you excel at, but, please, find a better writer if you want to continue making story-driven games. If you cannot find one, then maybe stick to other genres where an emotionally engaging story is of less importance, because you would want to stay away from the exploration genre where good storytelling really is the backbone of it all (without it, your whole creation will tumble and fall at the slightest touch). More environmental storytelling: with environments being your true forte, then why not utilize that talent more!? Look for example at games like Dear Esther or The Old City for examples on how to do it, because the locations in those games look like they do for a reason. Now, Dear Esther was a mixed bag for me, but I recognize the skill in how its story was told through different means (not only via the spoken word). Build on the stories you try to tell in each chapter. Expand on them. Make me care. I want to be engaged. Take a look at a game like The Vanishing of Ethan Carter in which storytelling is also a big theme. It managed to convey the joy of telling a story, while at the same time telling its own story. Look at how it did that. ¹Not to be confused with the other Caligo game being developed by Blind Ambition Studio (which is not covered in this review). Posted in Indie, Review.Tagged 3D, beautiful but empty, exploration, fauxlosophy, First Person Exploration, FPEG, indie, Walking Simulator.